"Deliver Our Mail Carrier"/"You Bet Your Sweet Beppo!" 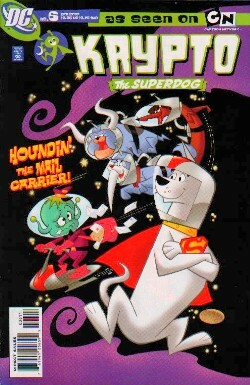 Krypto is visiting his pals, the Dog Star Patrol during Happy Fun Day (the intergalactic version of Christmas). The gang are waiting for the Intergalactic Mailman (the outer space 'Santa') but for some reason he hasn't arrived! When they track his ship they realise he vanished in the Lynx System and deduce quickly it was the plot of villainous Snooky Wookums and Mechanikat and race to save him. True enough the two villains are hip deep in toys, games and cards and gleefully writhing in their villainy. Crashing into Mechanikats ship they take on a horde of catbots and the evil duo themselves. After a strenuous fight the Dog Star Patrol rescue the Mailman and save Happy Fun Day! "You Bet Your Sweet Beppo!" You all know the story of how Kal-El came to Earth, what you don't know is Kryptonian monkey Beppo hitched a ride in the luggage compartment. The cheeky monkey leapt out as the ship passed over Africa and tried to make a home for himself. ...none of the animals could really get along with him. One day watching the skies he saw Krypto and followed his 'kindred spirit' back to Metropolis. Seeing Krypto performing super deeds Beppo tries the same with disastrous results. He repairs a falling bridge with stacked up cars, complete with passengers - much to the annoyance of Ace! He then mistakes Kevin for a Kryptonian who can't fly and drops him onto a high lamppost. The bad thing is nobody realises it's not actually Krypto causing trouble. Krypto feeds the poor with small fish, so Beppo sees Streaky hunting for food and drops a Marlin on the super cat's head! When Krypto gets home he is confronted by his angry friends who demand answers as the hero enters his rocket house. Before Krypto can retaliate a NASA space shuttle crashes into the sidewalk and they realize it's another Kryptonian refugee. Beppo, mimicking Krypto, just can't cope with Jor-El's other pet even with the help of Ace, Kevin and Streaky! Out of the Blue, Supergirl's pet horse Comet hurtles through time and interrupts the monkey business. He takes Beppo back to the future but not before hinting they will all meet again in the 30th Century... one day! Story - 4: Lame main story. Pure and simple. But the back up story - WOW! All the stops were pulled out to make this issue as fun as possible. Beppo and Comet were a perfect addition to this comedic adventure issue! WHY is this the final issue?! Art - 5: Still as sharp and fun as the first issue. Consistent style and story enhancing composition is what's made this title stand out. Cover Art - 4: Not the best cover to end the series but still a hot contender! I would have preferred a cover featuring the much stronger back up story. It's been a LONG time since all the Superpets graced a front cover! Sadly this fun series has ended after just six issues and it will be missed! I am hoping it will be given another shot even if it's just for the odd special or as a back-up in the new Legion Of Superheroes of the 31st Century book. Well we can all wish anyhow! I personally hope this isn't the last we'll see of Krypto, Streaky, Kevin and the gang!